Owlivia is an Eastern screech owl. 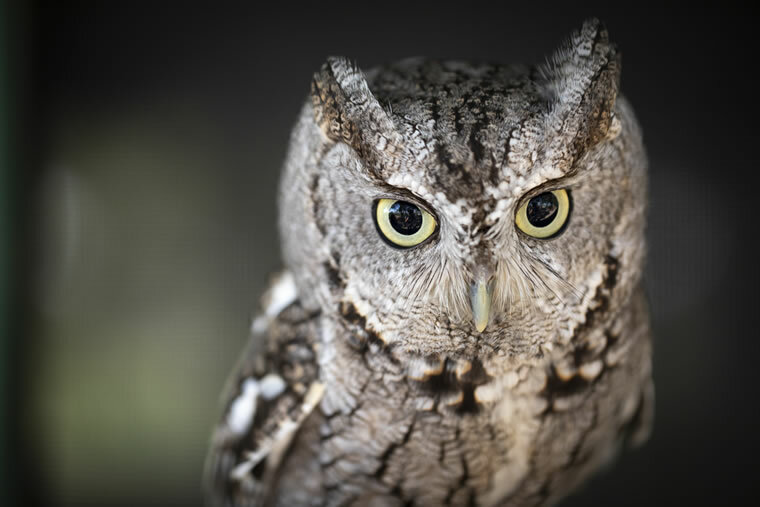 From seeking out wild owls to dissecting bird pellets, Sea Island offers a range of exciting opportunities to learn about, and even interact with, nocturnal birds of prey. It’s not often that humans have the opportunity to set eyes on owls. These beautiful birds of prey are most active at night, when much of the world is asleep. But despite their seemingly elusive nature, they play a vital role at Sea Island, according to Paige Hansen, an apprentice falconer at the resort. A chance to observe and interact with these nocturnal creatures is rare indeed, but there are multiple unique opportunities for members and guests to do so at Sea Island. 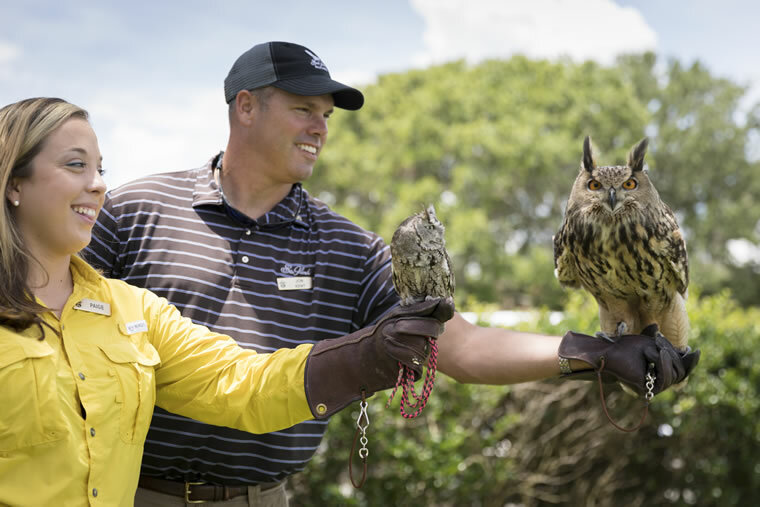 Sea Island members and guests can meet resident owls Owlivia (left) and Scout (right). Possibly the best way to get up close and personal with the birds is through the Owl Prowl program, a family-friendly activity that was designed to educate, entertain and introduce the audience to the raptors in Sea Island’s falconry program. The program takes place in the summer and participants gather at the Sea Island Beach Club, where they learn fun facts about owls and meet Owlivia, the resort’s resident Eastern screech owl, and Scout, Sea Island’s Eurasian eagle-owl. After soaking in the information and demonstrations, spectators head to the kids’ café for a hands-on activity: dissecting an owl pellet. “An owl pellet is basically a hairball full of the [indigestible] … material from the food they have eaten,” Hansen explains. “When owls consume a mouse, for instance, they [also] eat the fur and the bones. That [indigestible] … material stays in the gizzard, or second stomach, and forms a pellet that they compress and cough up [within] 24 hours.” She describes each pellet as “a surprise,” which lends to the intrigue as the dissection commences. “The kids view the owl pellets as a bit of a scavenger hunt,” Hansen says. The hourlong program ends with more exploration as guests and members are led outside to search for wild owls with the aid of red flashlights. If all goes well, the birds will respond to the falconer’s calls. Participants also have the chance to spot toads, ospreys, bats, marsh rabbits and more. Another way to get in on the region’s nighttime action is through the Nocturnal Island Adventure, a second program that takes a look at the isle’s nighttime inhabitants. This experience, which is also based out of the Sea Island Beach Club during the summertime, allows participants between the ages of 7 and 14 to enjoy dinner after exploring the local barrier island habitats. A naturalist leads children outdoors to seek out owls and other birds as well as sea turtles, ghost crabs, amphibians and other types of marine life that come out in the evening. In addition to the hike, educational presentations and themed arts and crafts, Nocturnal Island Adventure takes members and guests to the on-site nature room, where they can see animals like snakes and turtles. 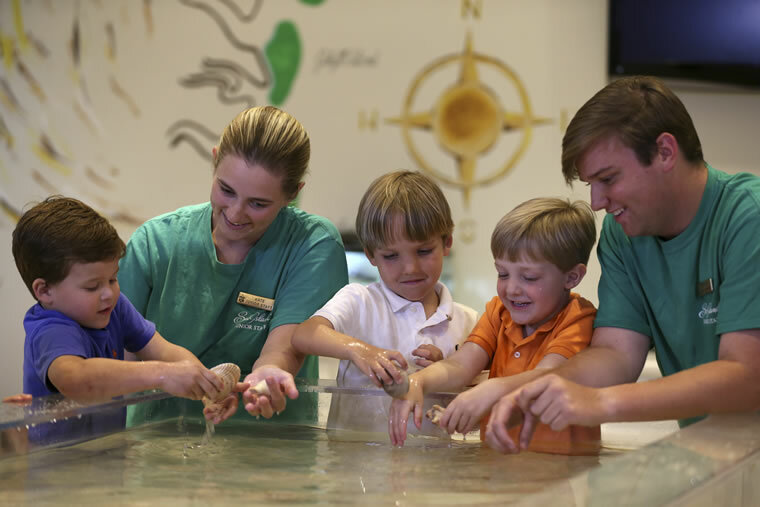 There is also a touch tank with creatures like rays and puffer fish. For both the young and young at heart, the Owl Prowl and Nocturnal Island Adventure offer new and exciting ways to learn about the natural world at nighttime. Discover more fun facts about these fascinating birds. Feeling Flexible: An owl can turn its head 270 degrees in either direction. Binocular Vision: Despite their incredible eyesight, owls have eyes that are immobile in the socket. However, they have a special third eyelid called a nictitating membrane that helps to protect the eye while they are hunting. Home Sweet Home: Owls do not create their own nests; they will use abandoned nests from other birds or seek shelter in holes or crevices in trees or rocky outcroppings. On the Hunt: Owls are opportunistic carnivores—their prey consist of small rodents, insects, reptiles and even other birds of prey. Although it depends on the species of the owl, some can sense their prey up to 100 feet away. Taking Flight: A group of owls is called a parliament, though they generally travel solo.